See various of printed sample in our gallery. 3D printing is set to revolutionize the field of microfluidics, but there are very few printers that have the ability to print functional microchips. MiiCraft is one of the few that can. 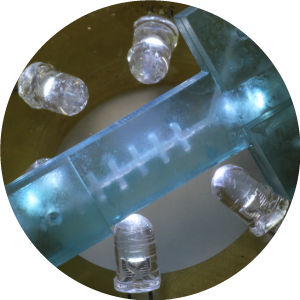 The ability to pattern 50 um features in all three dimensions is critical to printing microfluidic devices and this is easily achieved by the Miicraft. The rapid print times mean that a new user can go from design to printed chip within 3 hours. And the small foot-print means it will feat easily into any fabrication area. With the MiiCraft we can print almost any design – this has changed the way we think about microchips and is opening some really exciting possibilities to do things that we couldn’t even think of a few years ago. * Disclaimer: the consuming time depends on the users’ resolution setting. Want to know more about the research results on Miicraft products and 3DP technology?